The next phase of computing will soon replace the world of smartphones. These are the quiet times. From April to June, tech's biggest companies all held their annual mega-events, laying out their grand visions for the next 12 months or so. Facebook kicked it off in late April with its F8 conference, followed by Microsoft Build, then the Google I/O conference, and Apple's Worldwide Developers Conference finished things off. Amazon doesn't really hold events, but it unveiled two new Amazon Echo smart speakers during that period for good measure. And things will get exciting again, sooner than you know it. This Fall, Apple is expected to reveal a 10th-anniversary iPhone, Google will likely reveal a revamped Pixel smartphone, and Microsoft is expected to hold another one of its regular late-October Surface computer press conferences. In the meantime, there's not much to do but reflect on what we've learned so far this year about the future of tech. And beyond the hype and the hyperbole, we're starting to see the very earliest stages of a battle for the next phase of computing. Because while Apple and Google may dominate the smartphone market today, technologies like augmented reality present whole-new platforms where there's no clear winner. So Amazon, Microsoft, and Facebook, having missed out on owning a mobile platform, are doing their damndest to hasten the end of the smartphone — and the end of Apple and Google's duopoly, while they're at it. Every major technological shift has created big opportunities for the few entrepreneurs who see it coming early — in the seventies, Apple and Microsoft made big bets that the PC would be a much bigger market than gigantic room-sized mainframes, while the mainframe industry decried the PC itself as a fad. We see who won that one. 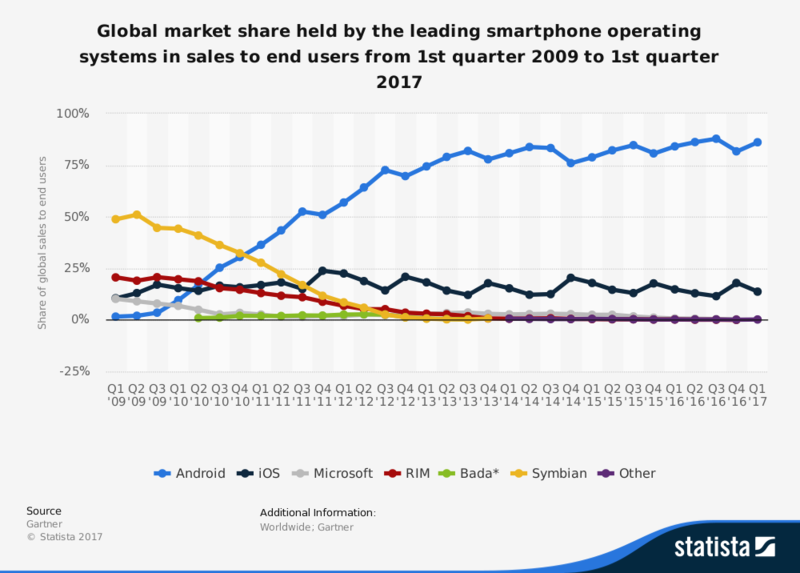 Similarly, Microsoft didn't fully realize the potential of smartphones, until well after Google and Apple proved them wrong. Now, Google's Android is the most popular operating system in the world, full stop. And the iPhone has propelled Apple to record profits and to the status as the company to beat in tech. Smartphones haven't made us into activists. They've turned us into helpless bystanders. Well, it seems like time is a flat circle. Right now, we're seeing the earliest growing pains of augmented reality and virtual reality — tech that overlays the digital world onto our human senses. It means information, projected into your eyes and ears, as you need it. Why carry a phone when Netflix and WhatsApp are floating in front of you? Some call it a fad, or just something that's too new and untested to be considered a real threat to the smartphone. And yet, there's a veritable arms race to build these augmented reality platforms of the future. Amazon's Alexa is primarily thought of as a digital voice assistant, but having a virtual "person" tell you the time and weather definitely qualifies as augmented reality. Microsoft has its reality-bending HoloLens "hologram" goggles. Facebook and Snapchat have both built augmented reality straight into the camera. Even Google-backed startup Magic Leap thinks its yet-to-released goggles have a shot at becoming a new platform. The net result is a race to build whatever is going to do the smartphone what the PC did to the mainframe. What these companies all have in common is that they missed the boat on building smartphone operating systems of their own. Now, it's on them to build whatever comes next. Apple and Google are well aware of the threat and are not standing still. Apple has ARkit, a system for building augmented reality into iPhone apps, using the phone's built-in camera. It's technologically robust enough and easy enough to use that developers love it, giving Apple a nice foothold in augmented reality. If and when Apple releases smart glasses, those apps will come right over. Google has various augmented reality efforts in the works, including Project Tango. And although the first version of the Google Glass headset flopped, if Google figures out how to revamp the device, it will have a vehicle to extend Android into the AR realm. In a weird way, going on the defensive like this almost gives Apple a perverse incentive to replace the iPhone: If Apple can build the next great hardware platform itself, it means that Amazon can't do it with Alexa, and Microsoft can't do it with HoloLens. In the meantime, as we appreciate all the new hardware and software goodies coming out later this year, keep the perspective that everything we're seeing now is the first salvo in a computing war that will rage for the next decade and beyond.